In our Portable propane gas grill reviews we found that they are winning in popularity and are sold more and more. Now the economy is picking back up more people spend money on recreation and maybe that is why they are sometimes called a travel, camping and RV grills. The sales of small portable gas grills are increasing and more people starting to see the easy to use features of them. For a long time a small gas grill was not easy to use because of the limitations and the fact that the heat most of the time was not evenly distributed on the grill. 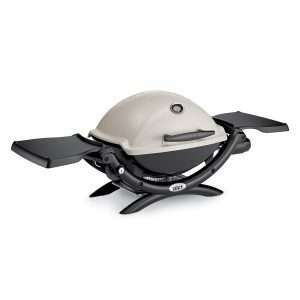 Now the quality is getting better we have decided to add these portable gas grill reviews to the website. The reason we chose this portable BBQ gas grill to be the first one to review is because we bought one our self. No better reason to have a good look at it and share our experience about this Char Broil portable infrared gas grill. We will do this Char Broil portable gas grill review from start to finish. Starting with the packaging and ending with our results about the food I cooked on it and how it held up to our cooking over a period of time. 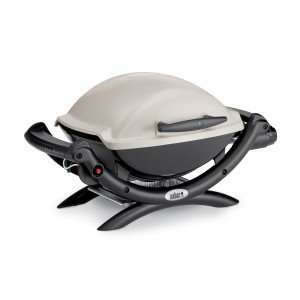 The Weber Q 1000 portable gas grill is the upgraded model of the Q100 or also called Baby-Q. 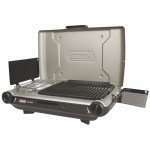 Like most portable propane gas grills the surface is not to big, but just great for camping, RV and or tailgating. This does not mean you can not use it on you patio or deck and grill some great food. The little larger brother of the Q1000 is the Weber Q1200. This Weber portable grill comes with a lot of nice features. Read the whole Weber Q1200 gas grill review here. 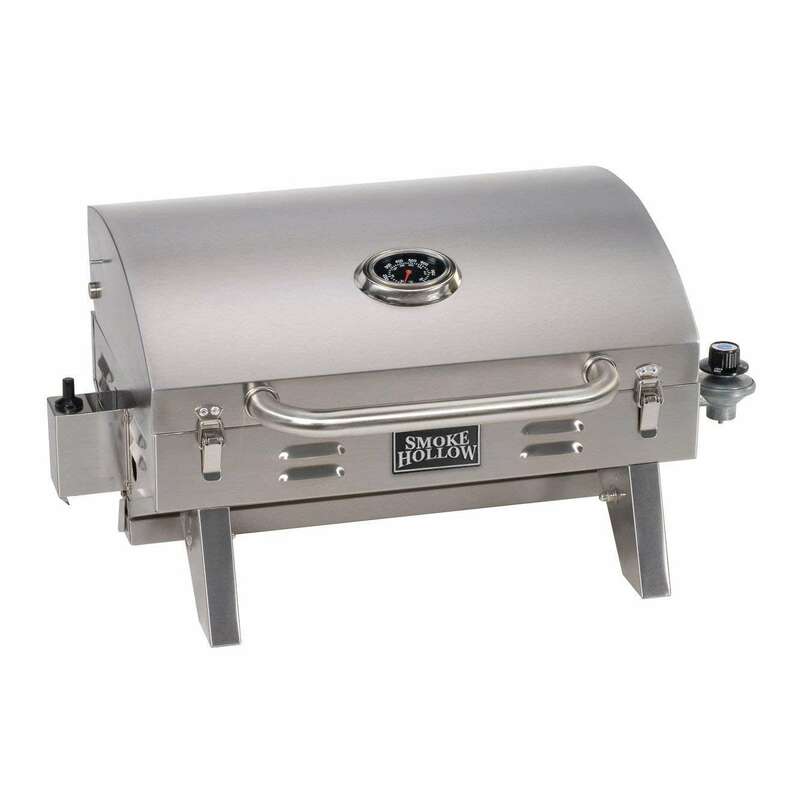 This Harley Davidson portable gas grill is built on the Q1000 and has basically the same specification and hat means that you can not go wrong with this portable gas grill. Read the whole Weber Q1200 Harley Davidson review here. Coleman has always been a very good and well known brand in portable grills and this one has been around for a while and got some good customer reviews. We got a closer look at this portable camping grill and are impressed with the results. Read the whole Coleman PerfectFlow review here. This portable propane grill had some nice features. This was not an easy portable gas grill to review. Many different opinions and this makes it easy to form an opinon. I did my Smoke Hollow 205 review for you to help you make up your mind. When I started on the portable gas barbecue reviews I found people are looking for different types of portable gas grills. 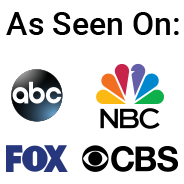 That means that they sometimes look for the best portable gas grill to be used as a small table top gas grill or for tailgating, camping, or for the RV. People use it for different reasons and that means that you have to take a look at what features you need. There is probably no one size fits all. If you do not like to fool with the small one Lbs gas tanks you can in most cases buy a propane gas hose adapter to hook it up to a larger propane tank like the 20 lbs I use. There are even adapters and regulators to connect it direct to you RV propane tank. Size is an other thing to take in consideration. 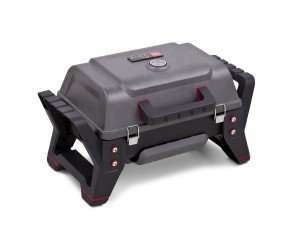 If you look for a portable grill for camping or RV a smaller is better to store than a larger model. The weight of a smaller is lower and can help your overall weight while traveling. I personally advice to buy the best portable propane grill you can afford and not to go for them cheaper models. They most of the time only last one season. By buying a good brand you can in most cases also get spare parts if you ever need one.